From the Chinese and United States first couples' meticulously arranged and memorable private visit to the Forbidden City to the US$250 billion (S$340 billion) worth of business deals announced on Thursday, Mr Donald Trump's maiden trip to China as US President has indeed been a "state visit plus". There was no reason for it not to be. Although the differences that had been pestering bilateral ties have not instantly disappeared, the most important takeaway from the talks between Mr Trump and Chinese President Xi Jinping in Beijing has been the constructive approach to these issues the two leaders demonstrated. Both expressed willingness to work with, instead of against, the other in dealing with the differences between their two countries, in particular over trade and North Korea's nuclear programme. Beijing and Washington have been working hard to find convergences on these two prominent issues and will very likely work harder, given the two leaders' agreement that cooperation between the two countries is the "only correct choice". But these matters are complicated and unlikely to have any quick fixes. Such precious progress in trying to find common ground, along with the Chinese commitment to establishing a constructive "new type of relationship" with the US, as Mr Xi again elaborated in his talks with Mr Trump, will go a long way to anchoring the all-important, yet sometimes volatile, Sino-US relationship. The concordant note struck by Mr Xi and Mr Trump not only showcased the personal rapport they have established, but also consolidated optimism about the prospects for bilateral ties. There is undoubtedly a lot of work left to do, as the US Secretary of State pointed out. 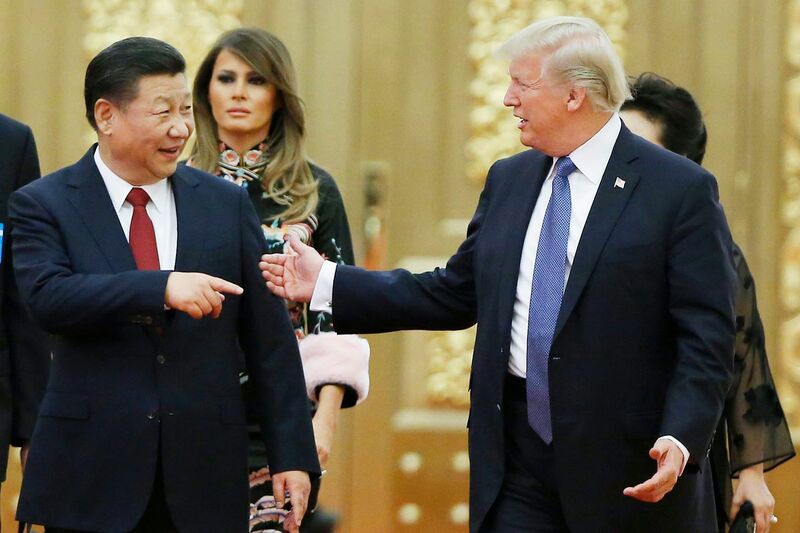 But the readiness of the two leaders to listen, as well as talk, was apparent in their public appearances, and offers hope that together, China and the US can do "tremendous things" to the benefit of both countries, even the world, as Mr Trump suggested. Certainly, China is willing since, as Mr Xi said, the Pacific is big enough to accommodate both and, although there are challenges that the two nations need to face, these are limited and there is boundless potential for growth. Amid growing tensions in the North Korean situation, it was significant for Japan and the United States to demonstrate their strong solidarity both at home and abroad. It is hoped that the move will enhance the stability and growth of the Asia-Pacific region. Japanese Prime Minister Shinzo Abe held talks with visiting US President Donald Trump, marking their fifth meeting ever. They dined together on four occasions this time. Their mutual trust has further deepened. A relationship in which they can be candid with each other will benefit Japan's foreign policy. With respect to North Korea, Mr Abe and Mr Trump agreed on a policy of cooperating with the international community to exert maximum pressure. At a press conference, Mr Abe expressed a policy of adding to the list of items subject to asset freezing. Mr Trump said: "The era of strategic patience is over." The two leaders reconfirmed that China, a backer of North Korea, needs to play a major role in reinforcing pressure on that nation. Both leaders confirmed the policy of a "free and open Indo-Pacific strategy", a diplomatic guideline shared in common by Japan and the US. Under the policy, the region stretching from Asia down to Africa is envisioned as a "place that values freedom, the rule of law and the market economy". Four countries, which include India and Australia, will promote security cooperation. In the economic sector, the issue of the Japan-US trade imbalance has become a focal point. Regarding US trade with Japan, Mr Trump said the US has to "eliminate our chronic trade imbalances and deficits with Japan". He strongly hinted at pursuing a policy of seeking concrete results in order to reduce the US trade deficit with Japan. At a meeting with Japanese and US business leaders, Mr Trump said that "our trade with Japan is not fair and not open". It is worrisome that Mr Trump emphasises the balance of the results, namely in trade balance, rather than fairness of opportunity through free trade. Automotive-related import accounts for 70 per cent of the US trade deficit with Japan. Meanwhile, imports of US-made cars to Japan are free of duty, but the US imposes a 2.5 per cent import tariff on cars assembled in Japan. So rather, it is Japanese-made cars that have been placed under unfavourable conditions. The imbalance in car trade has much to do with the choice of products, thus being also in line, on certain aspects, with consumers' interests. Simply carping at trade deficit numbers without looking at these realities is utterly anachronistic, reminiscent of the Japan-US trade friction seen until the 1990s. United States President Donald Trump's state visit to South Korea was significant in that it came amid a grave security situation on the Korean peninsula with North Korea. President Moon Jae In's surprise visit to Camp Humphreys, a US army base in Pyeongtaek, Gyeonggi province, to greet Mr Trump upon his arrival shows how important he considered Mr Trump's visit to South Korea. The two leaders sent a clear message of South Korea and the US working together by having lunch at the camp together. Also, that Mr Trump was the first US president to deliver a speech at the National Assembly in 24 years and that South Korea was the only country on his Asian trip where he addressed the Parliament reflected the weight of the nations' alliance. There were worries until shortly before the summit that Mr Moon and Mr Trump might reveal discord over their responses to North Korean nuclear and missile threats, the South Korean government's positions for the restoration of its ties with China, Mr Moon's balanced diplomacy as well as trade pressure from the US, but most of the worries turned out to be unfounded. Both leaders reaffirmed solid cooperation between their nations over North Korea's nuclear and missile provocations. Concerns about South Korea being passed over and Mr Moon's balanced diplomacy were eased as well. Mr Trump promised not to exclude South Korea, calling it a very important ally the US trusts. Mr Moon made it clear that he had no intention of walking a tightrope between Washington and Beijing. He said his balanced diplomacy is intended to enlist China's cooperation over North Korea's nukes. Among eye-catching outcomes are agreements that South Korea will buy a sizeable amount of the most advanced US weapons and that the US will allow South Korea to increase its missile payloads without limit. Nuclear submarines and cutting-edge reconnaissance assets are expected on the list of US weapons South Korea may buy. Washington may have demanded that Seoul purchase its arms to help reduce its trade deficits with South Korea. But the South needs to buy high-tech US weapons to raise its guard against escalating threats from the North. Still, there are many obstacles to clear towards a "great Korea-US alliance".